According to various professionals and researchers in addiction rehab center in Daly City CA that specialize in substance abuse treatment and recovery, problems regarding substance abuse can gathered from a combination of environment and genetic influences. Substance addiction can sometimes occur due to stressful environmental factors alone because it forces you to use drugs or alcohol as a coping mechanism. Everyone can experience peer pressure at any age, from as early as 15 years old to the late 40s. It can come from relatives, friends, co-workers, or an acquaintance. It is difficult to say “no” especially if your peers are taking drugs and alcohol and pressuring you to use it as well. Turning down the offer would make you rude and ostracized from their company. A lack of parental guidance is one of the biggest risk factors of substance addiction and abuse. A child is more likely to begin taking drugs and alcohol if his or her parents aren’t actively involved in his or her upbringing. Often feeling neglected, a child is more likely to use harmful substances to fill the emotional and physical void of being left alone. They will turn into alcohol or drugs to pass the time. At one point or another, everyone will inevitably experience stress. One may turn to any number of substances just cope with stress, especially under extreme conditions. A workplace, home, broken relationships, or even family can be a source of stress. You may try to release your stress by performing some healthier activities like meditation or exercising. Experiences especially the bad or traumatic ones are sometimes catalysts for substance abuse. Childhood traumatic experiences like physical or sexual abuse can cause psychological scarring that often increases your likelihood to take drugs or alcohol just to ease the pain. 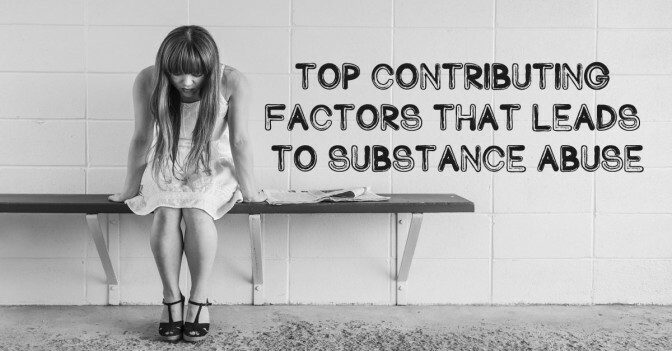 Issues such as pressure, parental factors, stress, and bad experiences are all facilitators for substance abuse. In order to cope with all the negativities that someone is experiencing, taking alcohol or drugs immediately solves the problem: it numbs the pain. However, continued use of these substances will just make everything worst. Getting proper psychological care to overcome these negative factors is the best and most effective way to avoid drowning in the world of substance abuse. By taking the necessary steps and entering in a substance addiction rehab center anyone can have a healthy and sober life, not only momentarily, but for the rest of your life.